But if you love games... You can't miss these great offers! Mighty pleased! Since one of my pals is gunning for black devotion for this weekend's tourney....figured I complete this today. 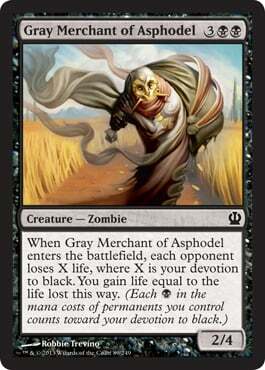 I really like the way the art went for this one... the colors take it away from its black roots. This piece was really a small break through for me... as I started to work on detailing (shadows, layering, etc) and the outcome was much much better. Getting used to the brush strokes too...will keep going =). And of course, thanks to the mighty support from my wife - who continues to spur me on! And the original card form for my non-magic friends! 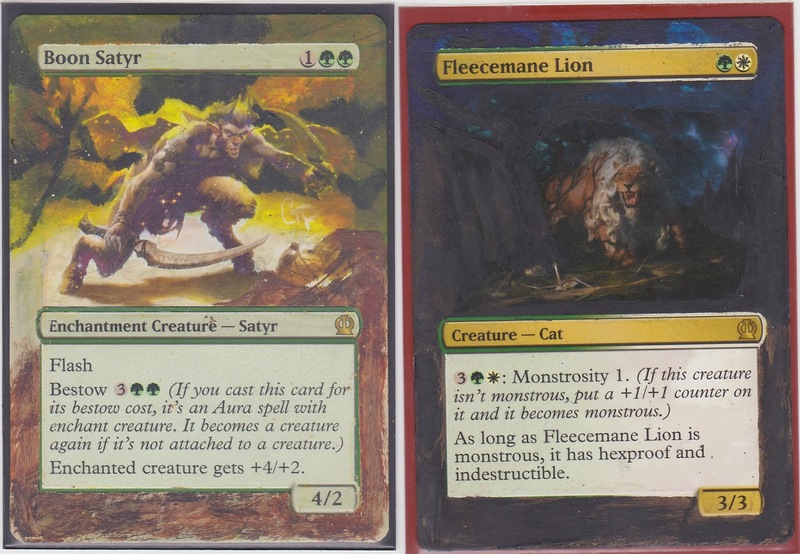 Had some spare time to attempt some work on selesnya cards =) Not too please with the lion! But having fun! 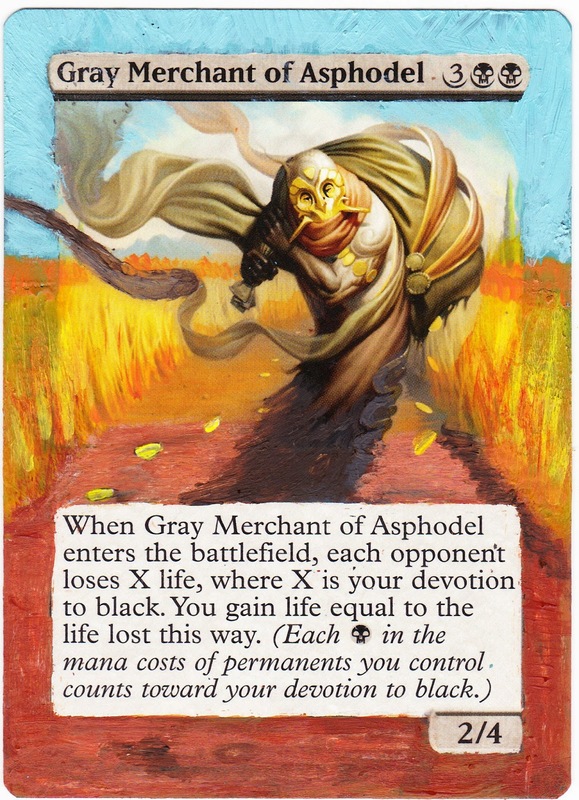 Have an order for Grey Merchant... excited! shall attempt it soon! ""Magic is a game that we all play but many players fail to realize that it is actually so much more than a game. 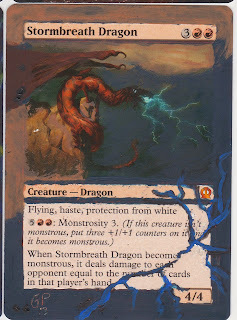 I have been involved in this community for a long time and while there have been ups and downs, overall the Magic community is awesome. I have made many close friends through Magic and there isn't much I wouldn't do for them. I want to thank you guys for being awesome! So the matter was brought up to a judge (Ian), whom in my personal opinion...did not handle the situation adaquately. Failing to sate the desires of the reportee ( who was incidentally given a game warning too? correct me if I am wrong) , the entire situation escalated into an all out slug fest in the forums. In Ian's defence, he was a relatively new judge and a little too eager to stamp his mark. Still, the whole situation left a really sour taste in the running of the event. In the midst, it also brought out the worse of the magic scene in Singapore...and continues to showcase the horrid behind-the-scenes that continually prevent our community of players from leveling themselves up. Collaboration is Zitsch amongst our biggest event organisers and shop owners. Being competitive is fine, that's good for us - the consumers. But it becomes silly when the major players in the scene are at open wars with each other. Name me one other event other than the GP Singapore where we saw the entire community having fun with one another? How many times have event organisers under-cut each other, copy and paste each other's ideas...in a bid to simply remove each other? Instead of being communal driven, too many of them are lost in their innate hatred for each other. Yes, I understand it is a business...but when you are talking about one that depends on a striving community - it's honestly blind faith to think killing the competition is the only way out. Collaboration! That was the buzz word 10 years ago. Sigh. Support trading. Magic is a community driven game. And it is pretty clear that Wizards tow the same line as well. Trading between players is the core of the entire experience. It invites people to be participative. It invites people to congregate. It invites people come again. And eventually, it invites people to trade and sell at your shops. Be creative. I have got to hand this to CMG Beauty World... at times they put in some of the best effort in making the scene fun and lively. Being competitive is fine, but it can be repetitive. Event organisers can really spruce things up by simply rewarding innovative play. That gets people willing to engineer new decks. 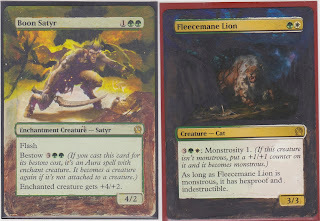 Need new cards. Be receptive to new players. This is the biggest bug-bear that differentiates the experience here and the ones I had abroad. We forget that the player base can only grow if people jump on the band wagon. Remember the feeling when our friend brought us a deck and invited us to try it first hand? That's not happening now! Kudos to Epic Gamers @ Bishan...that continues to issue out fun decks to beginners and making an effort to enlarge the community. We need that. The biggest barrier is to have the local scene crumble into having seasoned veterans facing each other over and over again. It happened 10 years ago and resulted almost in the death of our local scene as players found it hard get into the game. Wizards reworking of magic has greatly encourage new beginnings. Lets work on that! FNMs are the best starting point - reward mentoring/tutoring! Lastly, be FRIENDLY! We are all in this game for the fun of it. The difference between a Kiebler/Sullivan match and us is that they do remain to strike a banter, learn from each other's deck, share some tips and move on. Yes we are competitive but we can extend open friendship to one another. It isn't tough to say a nice 'Hello' and 'Good Luck' when playing. A simple handshake would suffice to end an excellent match. Being all grumpy face and sore in losing only turns the opposing player off...and there's one more player gone from the community! Understand the context of your event. 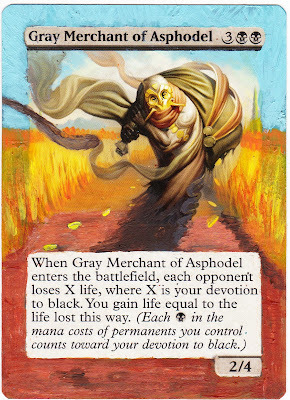 If it's a simple FNM, there isn't a point to rush your opponent, critique him for his lack of patience, hide mistakes and so on. Yes, you aint under any moral obligation...but what does that do for you at the end of the day? One more booster pack?